Ceramic total hip components have been used for 40 years, but have undergone many changes to improve durability and fixation. The first-generation ceramic components had high fracture rates and significant failures. Survivorship of first-generation components was 75%-84%. Both aseptic loosening and ceramic fracture were seen as modes of failure. system that uses a ceramic head and ceramic acetabular insert preassembled with a patented titanium sleeve. The ceramic components allow for fewer wear particles. The titanium shell affords greater stability. The Biolox delta Ceramic (Biomet, Warsaw, IN) system has multiple options afforded to it. One option is the Biomet delta ceramic head. It is intended for primary total hip arthroplasties. 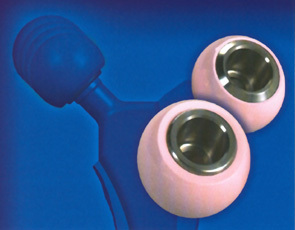 The Biomet delta option ceramic head may be used for primary surgeries or revisions owing to the addition of a titanium neck sleeve. Because of the ceramic components, these also have a low wear rate. The C2 a-Taper (Biomet, Warsaw, IN) is an implant with a ceramic head and liner. This system is for primary total hip arthroplasty. The acetabular cup has the porous plasma spray (PPS) coating, and the ceramic insert is a Bioloxforte component. 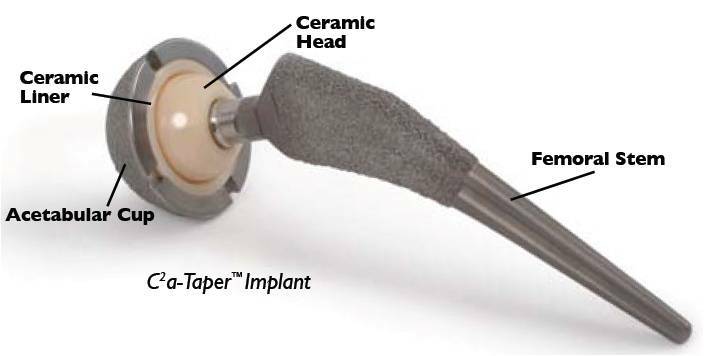 The Keramos acetabular system (DJO Surgical, Austin, TX) is a total hip arthroplasty system that uses alumina ceramic, which is promoted to have improved strength, smoothness, and wear properties. 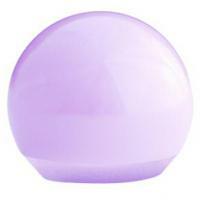 The alumina ceramic is made of high-purity aluminum oxide and magnesium oxide. The smoothness results from a layer of oxygen ions on the surface. The acetabular shell has a 3D Matrix coating. The Biolox delta ceramic head (DePuy, Warsaw, IN) is promoted as ceramic head with improved wear properties and increased stability. It is a Zirconia-toughened, platelet-reinforced alumina ceramic. Benefits of the alumina material include a high hardness, improved biocompatibility, and hydrothermal stability. Benefits of the Zirconia and strontium oxide added to the alumina matrix include an increase in fracture toughness. The Duraloc Option Ceramic Acetabular system (DePuy, Warsaw, IN) is promoted as a system that provides excellent wear characteristics, along with proven fixation technology. The alumina ceramic components have improved wear resistance, high hardness, and high component reliability. These are combined with the Porocoat porous coating composed of biocompatible titanium beads. A systematic review by Zywiel et al found 21 studies regarding ceramic-on-ceramic total hip arthroplasty. Survival rates at 31-240 months were between 73% and 100%. They also found that, for the composite materials, level-one data demonstrated a 98% survival rate at a mean follow-up of 31 months.level-two evidence demonstrated a 95% survival rate at a mean follow-up of 73 months. D’Antonio and Sutton studied the wear characteristics of alumina-on-alumina ceramic bearings and found that the benefits of alumina ceramics include biocompatibility, hardness, and low coefficient of friction. Inzerillo and Garino found that debris capable of scratching stainless steel, cobalt-chrome alloy, and titanium alloy head did not scratch alumina or Zirconia ceramic heads. The disadvantages they found included a risk of fracture, chipping, and squeaking. The alumina matrix composite bearings incorporate Zirconia, which increases the toughness of the material, burst strength, and 4-point bending. Another benefit of Zirconia is that the grain size is smaller than that of alumina. This has been approved as a head to articulate with polyethylene. Patients are monitored frequently during the initial perioperative period with routine radiography and clinical visits. These visits are extended to annual examinations, including radiographic evaluation following sufficient perioperative follow-up. Radiography is useful for evaluation of lucency, malalignment, or subsidence of the implant. Specific for ceramic implants, there is the risk of fracture or chipping of the bearings themselves, but less concern for wear. Squeaking has been discussed as a complication to ceramic-on-ceramic total hip arthroplasty. Approximately 0.5%-11% of patients experience squeaking. [6, 1] Revisions decrease the squeak rate to 0.48%. General complications for total hip arthroplasty include infection, bleeding, malalignment of the limb, malposition of the components, dislocation, and fracture of the periprosthetic area or the prosthesis itself. Walter WL, Yeung E, Esposito C. A review of squeaking hips. J Am Acad Orthop Surg. Jun 2010;18(6):319-26. [Medline]. D’Antonio JA, Sutton K. Ceramic materials as bearing surfaces for total hip arthroplasty. J Am Acad Orthop Surg. Feb 2009;17(2):63-8.[Medline]. Zywiel MG, Sayeed SA, Johnson AJ, Schmalzried TP, Mont MA. Survival of hard-on-hard bearings in total hip arthroplasty: a systematic review. Clin Orthop Relat Res. Jun 2011;469(6):1536-46. [Medline]. Boutin P, Christel P, Dorlot JM, Meunier A, de Roquancourt A, Blanquaert D. The use of dense alumina-alumina ceramic combination in total hip replacement. J Biomed Mater Res. Dec 1988;22(12):1203-32. [Medline]. Solarino G, Piazzolla A, Mori CM, Moretti L, Patella S, Notarnicola A. Alumina-on-alumina total hip replacement for femoral neck fracture in healthy patients. BMC Musculoskelet Disord. 2011;12:32. [Medline]. Schroder D, Bornstein L, Bostrom MP, Nestor BJ, Padgett DE, Westrich GH. Ceramic-on-ceramic total hip arthroplasty: incidence of instability and noise. Clin Orthop Relat Res. Feb 2011;469(2):437-42. [Medline]. Inzerillo VC, Garino JP. Alternative bearing surfaces in total hip arthroplasty. J South Orthop Assoc. 2003;12(2):106-11. [Medline]. Iris, this is just a blog – no specialist help available here.